Born in Paris of parents from the Aveyron region, who kept a café-restaurant, Raymond Savignac (1907-2002) displayed a gift for caricature from a very early age. His first decisive encounter occurred in 1933 when he met the famous poster artist Cassandre, who set him on his way by taking him on as his assistant at the Alliance Graphique. In 1943, Savignac was engaged as a designer at the Consortium Général de Publicité, owned by Eugène Schueller, the founder of L’Oréal. He left four years later to team up with his fellow poster artist Villemot; the two of them showed their works at a joint exhibition at the Maison des Beaux-Arts in 1949. There, Schueller discovered the “Monsavon Cow”, designed by his former employee, and published it immediately. It was a roaring success, launching Savignac’s career overnight. In 1951, he was awarded the Grand Prix de l’Affiche, the first in a long line of distinctions. Since then he has contributed to the image of many leading French and foreign companies, from Bic to Air France, from Dunlop to Pepsi Cola. He can also cast a humorously mocking eye on the advertising business – the “Garap” campaign is a prime example – and generously lends his talent to environmental and humanitarian causes. He has lived in Normandy since 1982. “The less you show, the more you say”, asserts Savignac. With clean lines, vivid and contrasting colours, and backgrounds from which everything superfluous has been removed, his keen-witted gaze goes straight to the point. At the same time his style has the immediacy of a gag and the self-evidence of a successful slogan. At once figurative and poetic, Savignac’s art seems to be borne along on a current of eternal youth. 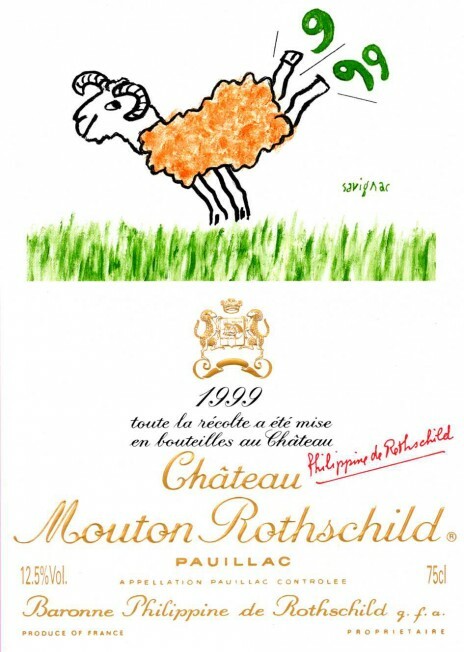 With a wink and a kick of his heels, the ram, the Mouton totem, invites us to the pleasure of wine-drinking and briskly dismisses the closing millennium.